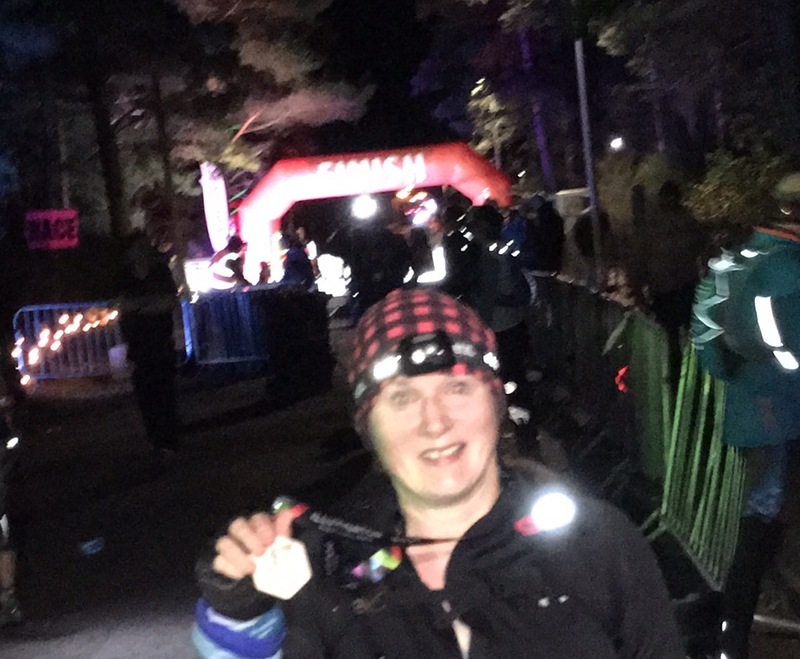 I was doing a race that had a compulsory kit list; fair enough – the race was up a couple of hills in the Scottish Highlands in the autumn in the dark. The kit list caused me twitchiness and anxiety: if you didn’t have the compulsory kit, you might be banned from running; if you took all the compulsory kit, you might be more of a pack horse than a runner and keel over, kit heavy into a ditch just past the start line. Glove Anxiety. I like to run with fingerless gloves on. They make me invincible and something of a superhero. They also mean that if you deck it, you don’t skin your palms. If you need to grab on to a tree or rock, it’s all good. But… would fingerless gloves count as gloves? My brilliant full-fingered sealskins are great for heavy clambering and freezing temperatures – but for a race on the cusp of autumn and winter? What if I wore them and they were too hot and made my hands all sweaty inside? And if I took them off I would have to stow them somewhere about my person and they are quite bulky. Or I could lose them on the course, but – eh – that’s not eco friendly and they are great gloves and totally expensive. So, should I have taken my thin, non-waterproof, narrow running gloves, designed for such an event as this? No. I wanted to wear lovely liberating and empowering fingerless ones. Which is what I did. I figured, in the event of a kit check, they are gloves; fingerless, granted, but gloves. Hat. Hat? No. Now a Buff/shall we say “seamless multifunctional headwear” ? Yes! But is that a hat? To save myself a kerfuffle at the start line, I messaged the organiser: “Does a buff count as a hat?” Apparently, if it covers your head to keep it warm, it counts as a hat. Good to know. Sleeves were the worst dilemma. That decision went down to the wire. I only wear sleeves for training when it hits 2 degrees or less. It was a balmy 11-13 degrees or something. There was a lot of debate and deliberation. Everyone else I was running with were going for long sleeves, on the grounds that once we were up on the open hilly terrain it would be pure freezing and windy and sleeves would be a good thing. So, I caved, took off my lovely cheerful orange t-shirt and put on my depressing long-sleeved black underarmour thing. 1000 or so racers, runners and walkers set off up a vertical incline and a mile and a half in, everyone is stripping layers off – firing jealous glares at sneaky wee jammy short-wearing, vest-sporting smuggins people, with their minimal packs and appropriately exposed flesh – and tying their waterproofs around their waist and rolling their sleeves up. Pretty warm, pretty warm; up the hill up the hill. I think it was mile six that I started to panic. We had had, I think, a descent, and we turned a corner for another gradual climb and I am thinking I AM ROASTING and trying not to shout out IS EVERYONE NOT TOTALLY ROASTING? and keeping running keeping running, thinking I WAS RIGHT ABOUT THE SLEEVES! WHY DID I NOT LISTEN TO MYSELF AND WEAR THE T-SHIRT? What to do? If I messed with my buff on the move, that would dislodge my head-torch and I would doubtless take a header into an oblivious capercaillie. I was on the verge of pulling over to the side and taking off the long sleeved top and running ‘taps-aff’ – it was dark, after all. Instead I managed to roll the sleeves up, open the neck right down and tuck the midriff section up my sports-bra, so that my midriff could breathe h the lovely fresh evening air. A little later on, there was a cool lighting and snack station, so I unplucked it all, so as not to offend with my air-cooled “abs” hanging out. Fortunately the temperature did drop a couple of degrees, so the sleeves were just about tolerable for the return leg of the run. I was very pleased with my run. At 15 miles it is the furthest race I have run, and I was enjoying it at the end – there was a good descent and a flat bit to the finish; lots of people were walking that stretch, which seemed mental as that was the descent and the flat bit… so I whizzed past a whole bunch of people in the last mile as my legs were still working. Honestly, the desire to jettison extraneous kit was almost overwhelming. I didn’t need: my phone, my jelly babies, protein bar, waterproof jacket, long sleeved top, spare torch or batteries. I also didn’t need my (non-compulsory) vaseline, my tissues or my foil survival thingmy.